OdiSqlUnload is a great utility for unloading but then we need to hardcoded and provide the parameters of the username and password which can change in the Other Environment in ( Testing , UAT or Prod ) . Here is a small trick to handle that situation. 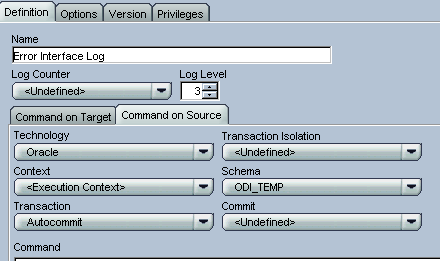 In the Command on Source, Select the Required Technology and Schema name . This way ODI will automatically get the parameters from the topology and also use the Fetch_Size 5000 for good performance . There is a “bug” in Oracle Data Integrator that doesn’t clean the SNP_EXP_TXT when the “parent” records are deleted. That happens because, in the repository data model, there is no FK between the SNP_EXP_TXT and its several parents table exactly because they are several. A consequence of this behavior could be a very slow answer when try to acess objects from Designer and/or Operator. That is very commom. WARNNIG: THIS IS A DML AGAINST ODI WORK REPOSITORY TABLES. ONLY EXECUTE IT WITH ALL TABLES IN UNION SUB-QUERY. IF NOT, YOU CAN DELETE VALID RECORDS AND SEVERLY DAMAGE YOUR ODI INSTALATION UP TO UNRECOVERY STATE. This is an Oracle DB query, adapt it for you Work Repository technology. You can, either, create a Topology to Work Repository and use an ODI Procedure to schedule this DML once a month, for instance! As always, comments are welcome!! Today we are going to talk about an old question that we already got several, hundreds, thousands (lol) of questions but, at true, is pretty easy! I would like to indroduce you to the Mr. SCD!!!!! 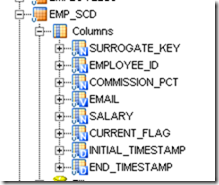 This post defines the necessary setting to use the Oracle Slowly changing dimension . STARTING TIMESTAMP – Column indicating the beginning of a Record’s availability. use SYSDATE or SYSTIMESTAMP depending on the datatype. Map the columns in this way where the Surrogate Key needs to be sequence . The ending timestamp and Current Flag columns need to be mapped even that the KM will populate those column accordingly. Just add any value to them. 1. If in case you don’t have any ‘Overwrite on change‘ column , please check the option ignore errors on Update Existing row., since in the select statement it wont find the column to do query and will error out. 2. If the Target datastore is table , Flow control or static control have to yes and the appropriate CKM have to be selected , else there will be error in Historize old rows saying ‘invalid user.table.column, table.column, or column specification”. Well, as you can see, no secrets to use it!!!! Nothing better to start our analysis that the real first step to start an Oracle Data Integrator 11g environment. It’s means REPOSITORIES! The visual interface is all new but the functionality is just the same… I liked this new interface to create “ODI things” once it’s just one place to do all. The big difference from 10g version is that, now, is possible to define a “external user validation” since the Master Repository creation. Pretty good to security protocols! When you First Login to ODI Studio, you will see an option to connect to Repository. For this post we are going with ODI authentication , the default SUPERVISOR password is still SUNOPSIS. Click Finish for ODI to create the required Master Repository. Once completed Login into Topology. You can specify the password for ODI Work Repository , as any one trying to open the Work Repository need to enter the password created now. Provide the ID and Name of the Work Repository and click Finish and once created . Click Connect to Repository and provide the necessary details and also selec the Work repository and once done Login into Designer. Well guys, as you can see, it’s not so different from previous version but, in my opinion, looks really better!!!!! ODI objects such as Packages, Interface, Variable and Procedure scenarios can be regenerated without manually regenerating individual scenarios using OdiGenerateAllScen. Drag in the OdiGenerateAllScen and select the Project and select Yes to Generate Package Scenarios and name it as Regenerate Package, similarly do so for other Object types and join them as shown below. The only advantage if you wish to regenerate just one object type you execute that particular step. Else call it Regenerate and select yes to all the option so that regeneration of all the objects can be done at once. Last week we have shown you the code for generating the Header and populate the same in OdiSqlUnload file , but the codes seems to be limited to the Database and then separate query needs to be created for each database reading from the System table,which doesn’t makes things so easy. In order to solve it and to make the codes independent, we have revisited and rewritten the whole codes to generate header. All you need to is to write the query you have used in the OdiSqlUnload . my_query = "select * FROM ODI_WORK.SNP_TABLE"
Look for odiexperts for more tips and tricks. In the last few posts we have shown how to display the SQL results in Operator , fetch the failed objects errors message in Package and various other techniques. Today we want to cover another small scripts which can enable you fetch details of the Interface that have error out because of PK , FK ,Not Null constraints etc and goes to the Error table. 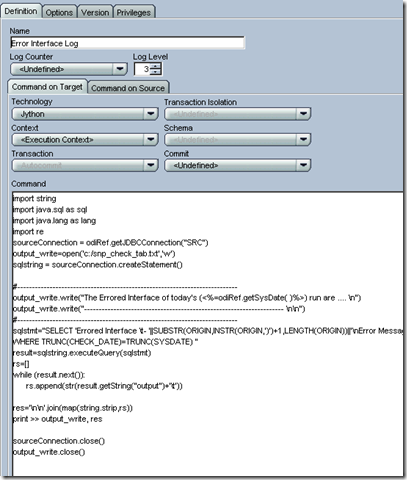 This scripts creates a File and dumps all the information by reading from SNP_CHECK_TAB table and finally file can be added to OdiSendMail and send to the Administrator or Developers so that they can know which interface got error records, so they can do the needful and also in daily load we fail to see all these smaller details especially we have hundreds of interfaces. ERR_COUNT AS OUTPUT FROM  ODI_TEMP.SNP_CHECK_TAB WHERE TRUNC(CHECK_DATE)=TRUNC(SYSDATE)"
and for every run you will get the sample output as shown below. Attach the File to OdiSendMail and get the daily Error Interface , Message and Records detail . 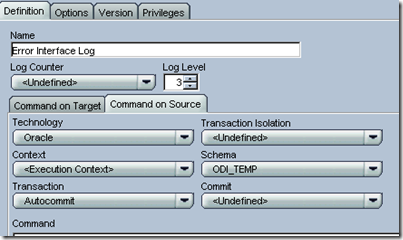 When we have multiple Interface, Variable and other ODI objects inside the Child Package and when such Child Package Fails we get the Error message ‘The scenario did not end properly’ and we need to look into the operator . Here is a simple code and process which can look into the Child Session and get the correct error message and also later we can capture the same in the Error Log . Create a Global Variable called “ GET_ERROR_MSG” and paste the following codes , so you can call and use it for multiple package. In the first step call an OdiOutFile and uncheck Append option so that new File is created for a daily run with Header and Date . Call the Child package and call the Variable and join the KO step ( red) to the Variable so that when ever the Child Package fails only then the variable is called else process the next child Package. In the next step , call the OdiOutFile and mention the path to File mentioned in Step 1 and in the Text mention the variable name and keep repeating the steps for multiple child packages. 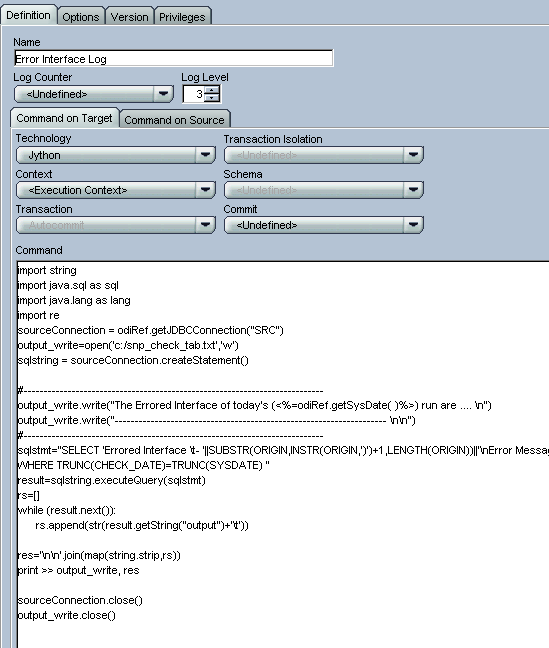 This way you can capture all the Failed ODI objects Error Messages into Single Log and send them as an attachment through OdiSendMail.